DENTON: In the year 2000, Hugh Jackman went global. There was - if I can call it this - Pea Head mania around the world when you took the role of Wolverine in 'X-Men'. Why did you decide to do it in the end? Did you have a lot of expectations from 'X-Men' freaks? HUGH JACKMAN: You know, very luckily I knew nothing about the X-Men except for the Aussie rock band the Uncanny X-Men. Right? That's all I knew. In fact, when I first heard about it, I was, like, "You're making a movie about the Uncanny X-Men?" This is bizarre. ANDREW DENTON: The Brian Mannix story at last. 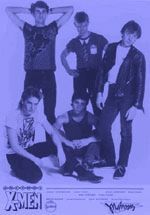 Uncanny X-Men were formed in 1980/81, first as a 4 piece band featuring Brian Mannix, Ron Thiessen, Nick Matandos and Michael Helms. Chuck Hargreaves later joined them. They fast became a popular live act around Melbournes pubs. Old time fan, Peter from Frankston, remembers them playing at the Pier Hotel, the Chevron Hotel, and the Doncaster Inn. He saw them support Cold Chisel at the Pier Hotel. Peter advises that the set lists back then comprised of songs such as Sounds of Silence, Running Out, Get No Chicks, Heart Balm,Too Many Cars, Hit And Run, One Night Stand, Pakistan, Summer Holiday, Best Looking Guy In The Factory, Silly Molly Mannos Serious Young Song Of Modern Love, Where The Fools, Am I Ever Gonna See Your Face Again, Revolution, I Wanna Be Your Baby, Give Me Head, Nazi At Heart, Bloody ********s, Television Eyes, Dont Talk To Me, Be With You, Wooden Heart, King Of Moomba(Sullivans), Get Back, After the Rain, Pretty Vacant, and Wanna Be With You. (Thanks Peter !! And if there are other old time fans from the early 80s who can tell us about other gigs I would love to hear from you). Their first EP Salive One, was recorded live at AAV November 2 1982 with the crowd favourite single Pakistan just two days after they signed contracts with Mushroom Records. After just 3 weeks they had reached number 11 in the Melbourne charts and number 39 nationally. They toured as a support act with Joan Jett in December 2002 and then released the single How Do You Get Your Kicks in April 2003. Kicks reached number 9 in the Melbourne charts. The single Time Goes So Fast was released in August 1983. The Beach Party EP followed, recorded live at the Chevron Hotel in Sydney on June 17 1984. It contained the rebellious hit single Everybody Wants to Work and the band now consisted of Brian, Ron, Chuck, John Kirk and Craig Waugh. 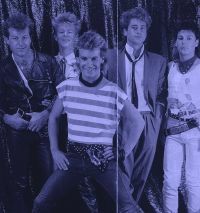 In early 1985 they were doing support gigs for Rod Stewart and then their popularity exploded across the nation with the huge hit singles 50 Years and Party and the album Cos Life Hurts produced by Rick Pinko Sims (aka Skyhooks Red Symons). 50 Years and Cos Life Hurts both went Gold in just 2 weeks and were Double Platinum after 3 months. Regular screenings on Countdown most weekends ensured their popularity around Australia. The antics of contraversial enigmatic frontman Brian Mannix, he of the tiny lycra pants, furry sporran, bleached mullet and quite possibly the only male to ever front a Cutex make up campaign, ensured the band stayed in the media's spotlight during 1985 and 1986. With his own newpaper column, various television appearances on shows like The Flying Doctors, Countdown, Blankety Blanks and Hey Hey Its Saturday, magazine covers by the dozen, hotel evictions following wild parties, and arrests for obscene language usage - it was hard to miss Brian or the band during those years. Compared to the actions of many singers and bands these days - what Brian got up to back then actually seems pretty tame now. Those were the days when public use of the "F" word was illegal and people like Brian, Molly Meldrum and Rodney Rude found themselves arrested for using obscenities in a public forum. The album What You Give Is What You Get! was released in 1986. By then Ronnie had departed for a new life in Sydney and had been replaced by Joey Amenta. The album spawned the singles I Am, Start Believing, and my personal favourite Don't Wake Me - with the obligatory pillow case featuring the title for true fans !! 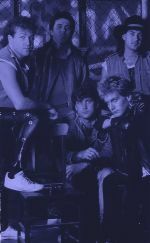 In an era when bands played live pub gigs every week for years, building up their fan bases before raising enough funds or attracting a record company to cut a record, when an appearance on Countdown or a small mention by Ian 'Molly" Meldrum could make or break a career, when the live performace was the key to success, when the charts were filled with dozens of Aussie talents, the X-men were able to break into the charts and dominate for a period in the 80's. At their peak they had the largest fan club membership in the country. Fans were called Xmaniacs and believe me - we were manic. I have a lot more respect for the bands of that era. Unlike the chart toppers of today who appear on reality programs or soap opera's to gain a fan base, before releasing a debut album, followed by a greatest hits album, before they contemplate performing live or commencing a nationwide tour. These days its a 2 song performance at a signing appearance in a shopping centre that constitutes their "live" experience. Note that I refer to the chart toppers - because the sad thing is the real bands out there are not the ones topping the charts. Everything has a lifespan and by 1987 X-Men had started to fizzle. As band members drifted away, a farewell gig took place at the Armadale Hotel in Melbourne on December 20 1987. Music life continued for Chuck, who toured with Daryl Braithwaites band thru the 90's, and for Brian, who went on to act, write, release a solo album, produce a musical and currently tours with other aussie idols of the 80's. I hope you enjoy my little dedication to Brian and the boys. This site will have various pages linked on the left under construction as I slowly make my way thru my boxes of memorabilia and transfer it onto the site. Thanks for visiting. Please leave your comments about the site and your memories of the X-Men in the guestbook. All stories about the fandom side of it will eventually be added to the Xmaniacs page - so start digging out your old photos !!! If you fancy a gossip about the good old days - come and join us in the Yahoo or MSN Groups. If you have an X-men related link (80's bands, cover bands, Countdown etc) let me know via the guestbook or discussion groups and I will add your banner to the links page. If you want to be a part of the Xmaniacs Page - Contact me via the guest book. If you are an ex X-man - welcome and we still luv ya !! Any info you wanted added to your own page is more than welcome, just let me know. ENJOY ENJOY ENJOY - cos every body wants to work............ no no not me !! The Uncanny X-Men Fansite has been closed as of Feb 2019.